When designing a kitchen, a well considered lighting scheme planned early on is vital to the overall finish of the space. You'll want to consider how you'll use lights in a practical sense, as well as how they look aesthetically and the mood they create. So, whether you're designing a new kitchen from scratch or want to define the zones in an open plan kitchen diner and living space, here's how to plan kitchen lighting effectively. If you're planning kitchen lighting as part of a full kitchen redesign, you'll find out guide to how to plan, design and furnish a kitchen a handy read. For more inspiration, take a look at out kitchen lighting ideas design guide. Of all the rooms in the house, the kitchen perhaps sees the most varied activities, and if it's combined with a dining and living space, the most action, too. When designing your lighting scheme, consider the tasks you may undertake in your kitchen diner – whether preparing dinner, working at a kitchen island, intimate or family dinners at the dining table – and you’ll begin to see why getting the right lighting in the right places can really help make this space a success. Working out orientation and how much natural light your room gets will help inform the lighting planning process. For example, north-facing rooms are likely to be light-starved; east-facing rooms will get little light in the afternoons; while south- and west-facing kitchens are likely to be naturally bright well into the late afternoon. Think about natural dark spots, too. For example, if you’re planning a kitchen extension, the area in the deepest part of the extension will lack natural light, and might need lighting during the day. However, it's worth talking to your architect first about improving light levels with glazing, bi-fold doors and rooflights, keeping in mind the location where in the kitchen they would work best before you start planning the lighting scheme. Ceiling heights will affect the room's natural light levels, as well as the surfaces you're planning on installing in the kitchen – light-coloured kitchen cabinets, kitchen flooring, worktops, kitchen paint colours and high-gloss finishes will all bounce light around and lessen the need for artificial lighting. For more advice on how to plan and design your kitchen extension, take a look at comprehensive guide. Working this way will also help you pinpoint where your light switches will be; if yours is an open plan kitchen diner and living space, you may want lighting controls at both ends of the room. 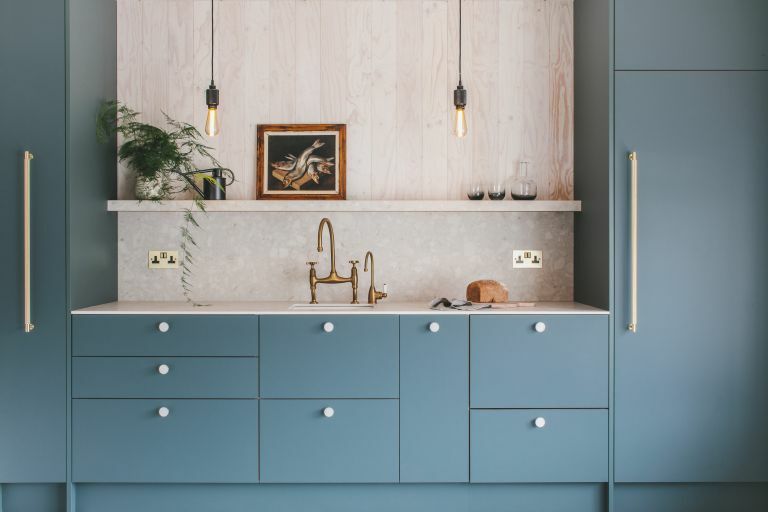 Including different layers of light in your scheme will give you the best of all worlds: a kitchen that functions brilliantly, but one that looks good or that you can quickly conjure an atmosphere in, too. Task lighting is purely practical and should be designed to allow you to prep and cook safely, and perhaps use an area of the room for reading or homework. Task lighting might be ceiling downlights and under-unit lights, well placed above worktops in order to illuminate task areas. Accent lighting is used to highlight of softly light elements of the kitchen. So, if you’re including a kitchen island or dining table, pendants both as a focal point and to focus a soft glow on the table will do the trick (hang pendants in odd numbers – they look better). Similarly, LED strips under breakfast bars, beneath 'floating' kitchen islands, over wall units or illuminating shelves within cabinets can provide accent lighting, highlighting these features while contributing a warm backlight to create atmosphere in the evening. Ambient lighting – in other words, general background light – can be provided by wall and table lights, but also by your main task lighting if it's controlled by dimmer switches. How many circuits? An average kitchen will need three circuits: one for downlights; one for pendants; and one for under-unit lights, for example. How many zones? An open plan kitchen/living/dining space will need more circuits, because you should treat each zone's lighting individually. Which lights when? How will you use the space and what lights do you want switched on at the same time? For example, it makes sense to have the kitchen on separate circuits to the living/dining space, so that you don't have to look at the washing up while you're relaxing. Planning a successful lighting scheme is also about getting the light colour/quality right, too. This is somewhat subjective, but you should choose bulbs that not only flatter the space but make it feel welcoming, too. Light colour can impact dramatically on your scheme. Take, LEDs, for instance: their colour temperature is measured in kelvins (or K) — daylight measures around 6,000-6,500 kelvins; candlelight comes in at around 1,800 kelvins. While you may want your LEDs to give off cool white light above worktops, warm white is much more relaxing for dining or living areas. How to get the balance right? A good electrician will advise on how many downlights you'll need but, as a guide, an average-sized kitchen, at around 4m x 4m, would need six. Designing a kitchen on a budget? Track or monorail lighting can be a cost-effective alternative as you can position lights on the track to target the key areas you want to light. Who can install kitchen lighting? Your builder: if you're planning a kitchen extension, it's likely your builder will bring in an electrician to carry out the lighting work alongside the first fix of other electrical fittings, although you may want to engage a lighting designer to oversee the planning at the very least. Your electrician: if you're fitting lighting retrospectively or are project managing your kitchen renovation yourself, your electrician can do the work. You: if you're fitting your own kitchen, you can take on some of the work yourself (for instance, chasing out walls), but only if your electrician is happy to sign it off. Be aware of what you can and can’t do: Part P of the Building Regulations legislates for DIY electrical work and states that if a job is ‘notifiable’ – such as adding a new circuit or replacing a consumer unit – it either needs to be carried out or certified by a registered competent person, such as a NICEIC member, or inspected by building control. Don’t put lights too close to cabinetry as if you have low ceilings, the glare from the lights could discolour the veneer. If you have low ceilings, you will need fewer downlights; too many and the light will be overpowering. Use spotlights on dimmer switches so you can easily control light levels. Include mood and task lighting in a scheme so that when you’ve finished cooking you can turn the bright lights down and have accents more suited to a sociable eating environment – not bright or harsh lighting. Ensure light switches are compatible with the style of your kitchen. LEDs are most certainly the way forward when it comes to lighting. In comparison to outdated halogen bulbs, they’re a far more cost effective and eco-friendly solution. The low wattage of LED lights means that energy consumption is reduced, and they also last longer. LEDs will last for up to 40,000 hours compared to the 3,000 hour lifespan of halogens. Looking for more kitchen or lighting advice and inspiration?